Take your soul out on a joy-ride! Mandalas are an easy and fun way into meditation, personal awareness, and creative self-expression. What is a mandala starter kit? It's a set of <b>tools to help you draw beautiful mandalas</b>... even if you've never drawn a mandala before. You don't need artistic talent. You just need a desire, a pen, and this kit. What is a mandala starter kit? It's a set of tools to help you draw beautiful mandalas... even if you've never drawn a mandala before. You don't need to already know how to draw. You don't need artistic talent. You don't need to struggle with a collection of instruments like compasses, straight-edges, stencils, or curve rulers. Now You Can Make Beautiful Mandalas All you need is a desire to draw mandalas, some paper and pens or pencils, and the Personal Mandala Starter Kit. Without this kit, drawing a mandala is complicated and difficult. You need to find or draw a large, flawless circle within an even square. You need to think of things to draw in it. You need to try to figure out what makes a mandala. You need to visually size up the elements. You have to guess at where things should go. And you have to juggle a lot of drawing tools at the same time. The thing is, even with professional drawing tools, it's not easy to get things to look right. Even experienced artists find it difficult to draw a mandala with such things. Not to mention the cost of buying all those implements. That can easily run you a $125 dollars or more. For tools that only half help you! And you still face what may be the biggest obstacle, which no other tool can help you with... What To Draw! The Personal Mandala Starter Kit, however, has been created especially with all these needs in mind. It offers you easier tools than you can buy anywhere else, because they're all integrated into the pages you print off. And perhaps even more important, it gives you over 200 ideas of things to draw. The best part is, you can use these tools over and over again. They can't break, wear out, or get lost. So in this one book, you get a lifetime's worth of mandalas to draw. So is there anything the Personal Mandala Starter Kit doesn't provide? Only one thing: it is waiting for your touch to bring the mandalas to life. 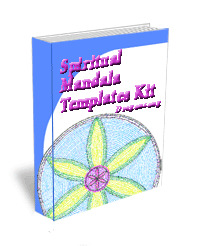 And as a bonus gift, you will receive the Spiritual Mandala Templates E-Book to download, absolutely free! Here are 56 (fifty-six!) Mandala Templates based on ancient symbols from spiritual traditions from around the world and throughout history. So not only will you have the many "mundane" mandala templates to play with, you can expand your mandala meditation by starting with these spiritual symbols, including . . .
For more information, please see the homepage link at the top of this text.